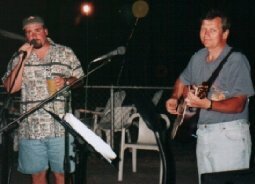 Mike Philip (vocals) and Dennis Buchholz (guitar, vocals) are the original Nautical Wheelers. Recently, a welcome addition has been the bass guitar of Ken Polcak, another member from the Captain Quint group. As Mike tells the story, whether you can believe him or not, his great-aunt was a member of the legendary square dance group in Key West, Florida. Jimmy Buffett wrote about the group in the song Nautical Wheelers on his White Sport Coat & a Pink Crustaecean album. That the acoustic group plays regularly at the Key West Bar & Grill (located adjacent to the BWI Ramada), Hanover, Maryland, adds a certain ironic luster to the their appeal. Directions & contact info for the Key West Bar & Grill can be found here. 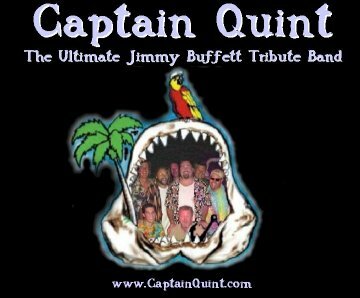 Nautical Wheelers is an acoustic Buffett Tribute Band that appears regularly around Anne Arundel County, Maryland. Mike, Dennis & Ken have a lot of fun and their a stage presence is similar to Jimmy Buffett's in his barroom days. The groups sometimes naughty antics get the audience invovled, especially now that Mike has a cordless microphone. If you want a larger sound, they are occasionally augmented by up to three members of the Captain Quint group. The Nautical Wheelers' song list is comprised mostly of Jimmy Buffett's older music - the Gulf & Western sound. But, be forewarned, they'll also break into a Buffettesque version of the Grateful Dead's song Uncle John's Band or Garth Brooks' Two Piña Coladas, not to mention Dennis' special, David Allen Coe's Put Another Log on the Fire. Be sure to catch their antics at either the Key West Bar & Grill or Coconuts. Their upcoming play dates are listed below. For booking information, call or e-mail Mike Philip at 410-969-3122, or Dennis Buchholz at 410-987-6855. Performances @ Key West B&G from 6:00-10:00pm (Island Time). Performances @ Coconuts B&G are from 5:30-8:00pm. Click on Songlist to see what the guys can do.